Let Green Bay Tree Service maintain your trees by enhancing their appearance with our professional trimming and pruning services. Regular trimming and pruning will not only maintain the beauty of your trees but also ensure their safety. Untrimmed trees are both unsightly as well as potential hazards to your property and life. Untrimmed trees are also more susceptible to storm damage making them doubly hazardous to your property. Also, tree branches touching your house, especially your roof, often times will void your homeowner’s insurance policy. We are experienced and skilled in trimming all species and sizes of tree. Routine trimming maintains both their appearance as well as contributing to their health. During the trimming process, there is no better time to assess a trees health – we always take the opportunity to advise our customers as to the health and well-being of their trees. We might be conflicted when we write this, but virtually no property we see has trees on it that don’t need trimmed or at least pruned. It is truly transformative to see before and after photos of a neglected, overgrown tree. Tree trimming and pruning can significantly change the look of your landscape. Further, trimming an overgrown tree can have critical effects on nearby plants and grass. Often times, an overgrown tree will overshadow plants and grass inhibiting their growth. We following tree-trimming guidelines set forth by the Arbor Day Foundation (as illustrated in the photo to the right). We practice a disciplined process when trimming trees to ensure limbs and branches are not cut too close to the trunk. We don’t over trim, and we maintain the inherent shape and style of the tree species. We have all seen over trimmed trees and how unsightly they are – Green Bay Tree Service will never trim trees so they look unnatural. Further, we are mindful of resident landscape plantings and other flora to ensure we don’t do any damage while trimming your trees. Our tree trimming begins with an in-home or business visit by one of our professionals to both assess the job and provide an onsite estimate. At that time we can schedule the date/time for the trimming and go over any other tasks you would like us to do. We will follow you instructions on the extent of trimming yet will advise you if we suspect the tree may end up disfigured by too much trimming. We approach trimming as disciplined to safety as we do tree removal. Whether we use our heavy equipment or simply tree climbing harnesses, we are safety conscious first and foremost. During tree trimming, we operate with the same process in terms of a ground crew ensuring safety and constant clean-up of debris. We will cut all large limbs into 3-foot sections for stacking or removal. All small branches will removed to the chipper station on the street. Finally, we will leave your property as we found it – you will never know we were there. Pruning is a less aggressive form of tree trimming. We can prune all trees that are not significantly overgrown. 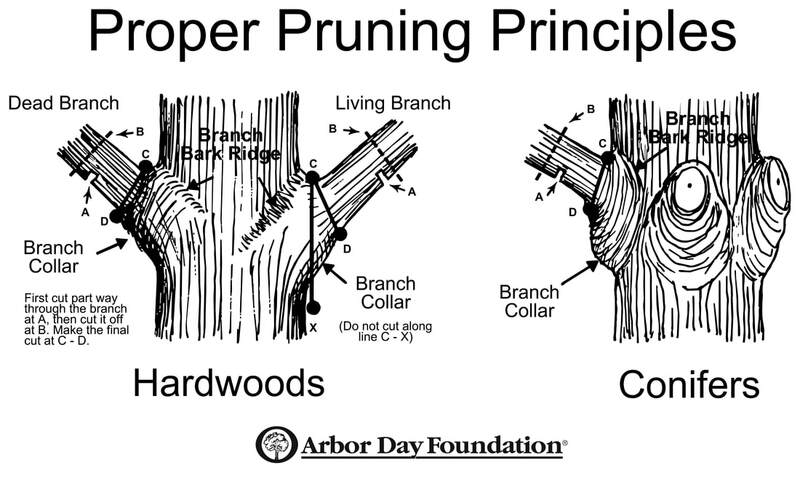 Pruning involves subtle shaping and branch removal work maintaining an already natural appearance. Water shoots and bottom growth will also be removed. We are skilled in the subtle art of pruning so that growth is enhanced while manageability is maintained. Ask us to prune hedges and shrubs while we are doing your trees – it will save you time and money.